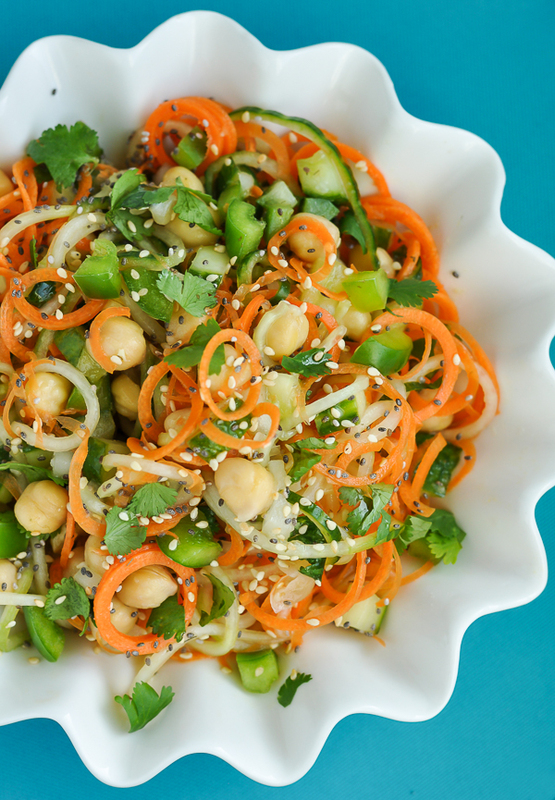 You’re going to la-la-loooove this sweet and sour Thai carrot and cucumber noodle Salad with refreshing cucumber, carrots, chickpeas, and peppers, topped with cilantro, sesame, and chia seeds and drizzled with a homemade sweet and sour sauce. Combine lemon juice, olive oil, vinegar, garlic powder, dill, salt, and minced garlic and whisk to emulsify. In a medium bowl add chickpeas, minced onion, chopped bell pepper, 1/2 an English cucumber [chopped] and cilantro. Pour in dressing and mix thoroughly. The longer you allow them to marinate the more intense the flavor will be! Next, using a spiralizer or vegetable peeler, curl one english cucumber and 2-3 large carrots [the biggest, thickest carrots you can find] into raw spiral noodles. Whisk together 2 tablespoons of honey with 2 tablespoons of rice vinegar and pour over salad. Top with extra chopped cilantro and a hearty sprinkle of sesame and chia seeds. If you're adding chopped nuts, toss those babies on top too and have at it!